Thanks for the comments on the flower picture. I’m rarely given flowers and the few times that I have been, the guys have been off the mark (sorry, I’m just not a roses or daisies kind of girl). Happily, this time, he was right on. The poet brought me this sprig of fresia before we went to see big at the Atlanta Ballet. The evening was marvelous (seriously the best dance performance I’ve ever seen and probably ever will see), followed by a late dinner at Top Flr (my favorite restaurant in Atlanta, co-owned by my friend Jeff Myers, and the current home of the pastry chef I apprenticed under, Taria Camerino), and a glass or two of a nice shiraz I picked up at the Dekalb Farmers Market (note: cheapest place to buy imported wine and beer in Atlanta). All in all, a rad evening and I thought I’d share the flower with you. On a different note, who doesn’t love stir fry? I mean, seriously, can you admit to not liking it? As you can tell from almost everything I make, if I can cook it in a wok, then I will. So today, with my one day off of class and work, with 800 million papers to write (oh, the end of the semester is so much fun, let me tell you), I needed to eat something that was quick and easy to cook with minimal clean up. I had almost succumbed to pita and hummus…but I figured something with color might be a better option. Thus, without further ado, I give you sweet and sour stir fry a la Cupcake Punk. And I’m back to my papers pronto. Saute the onions and garlic in oil until slightly translucent. Add the tofu and saute it for 2-3 minutes. Be careful not to burn the onions and garlic. Add the broccoli and bell pepper and cook until slightly al dente (this took approx. 10 minutes for me). Meanwhile, combine the rice vinegar, brown sugar, ketchup, and soy sauce in a pan over medium heat. Add the cornstarch-water mixture and stir/whisk until smooth and slightly thickened. Add more water if necessary. 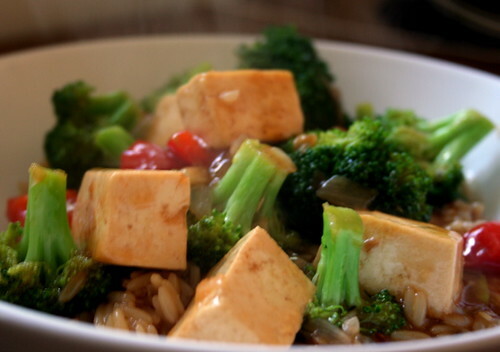 Pour the sauce over the veggies and tofu, cook for one minute until everything is covered. Serve over rice. that HAS to be one of the most (if not, THE most) tantalizing sweet & sour stir-fry dishes I’ve ever seen – seriously!! it’s divine!! Stir fry is such a great go-to meal, and your version definitely looks tasty! That looks so fresh and delicious. I call them 1-player foods. Sometimes they just hit the spot! Stir-fries are the best. They’re super easy, yet always delicious! When I was first teaching myself to cook I made stir-fries 3-4 times a week. Sounds tasty! Also sounds like you could make that sauce up in bulk & put it into a jar in the fridge.